are any other comets doing any deals? our local on Monday was p**s poor! thanks for sharing,gonna be checking this out at my store!!! Ewwaxo- looks like the only beats I can afford this year. posters are saying UPTO 50% so are these marked up as 50% off? Tunbridge wells store have %50 off aswel just got two pairs of wireless ones. Not many left in stock. Can someone buy me a pair and sell them to me please? I'll pay postage n a bit extra for their troubles. so they have the wireless ones in stock also? I have a pair of solos and a pair of Sennheisers I bought for £60. The Sennheisers are miiiiiiiiiiiiiiiiiiiiiiles better for sound quality. The Beats are good because for travel because they fold up easy but even then, they hurt your ears (comfort wise, not cause they're up too loud or anything...) if you wear them for more than a couple of hours. I wouldn't really recommend them to anyone as their primary headphones but at this price they're a good deal for secondary headphones. If you plan on using them for long periods though I'd look elsewhere. Yes, you keep telling yourself they were worth the money. Most of us know that are barely worth a quarter of their usual price. They are a fashion accessory for people with more money than those that buy Skullcandy cans. Personally, I like my music to sounds great, so will avoid these like the plague. my local doesn't even have any of these, but thanks OP for the proof. Those blow beats out the water, into a different ocean, for 80 pounds . Or try pioneer hdj2000. Blow the 280 pound beats through the floor, for 230 pounds rrp. 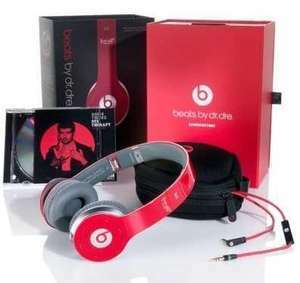 Beats are 250 for the good ones, or 350 for the studio pro edition. Go to hmv they have beats on display you can hear. And there's no way there worth anywhere near the price they charge. Stay clear. Saying this half price solo for 63 is good. any sign of denon ahd2000s? Overpriced and overhyped. No technical data available for any of their products. All it is is marketing blurb! Overpriced and overhyped. No technical data available for any of their … Overpriced and overhyped. No technical data available for any of their products. All it is is marketing blurb! Yeah, and Justin Bieber is sick! Wow so why waste your time looking at the deal ? The good reviews are written by people too ashamed to publicy admit they paid a fortune for crap cans. After trying out a few pairs of beats in-store, I now find myself pointing and laughing at anyone I see wearing them. I also think you're just trolling, but I really wanted to write the above comment anyway :D.
End of the day this is brilliant price for this product. Good find and heat added. Paid in exact change for £67, nice! Apparently it's only 50% off in stores that are closing 3rd December and on their website it says 50% off everything apart from TVs and laptops . No comet near me. Really wanted to get the Justin Bieber ones as my daughter wants them for Christmas. Voted hot thou!